Chemistry X | Metals and Non-metals | HOW DO METALS AND NON-METALS REACT? HOW DO METALS AND NON-METALS REACT? In the above activities, you saw the reactions of metals with a number of reagents. Why do metals react in this manner? Let us recall what we learnt about the electronic configuration of elements in Class IX. We learnt that noble gases, which have a completely filled valence shell, show little chemical activity. We, therefore, explain the reactivity of elements as a tendency to attain a completely filled valence shell. 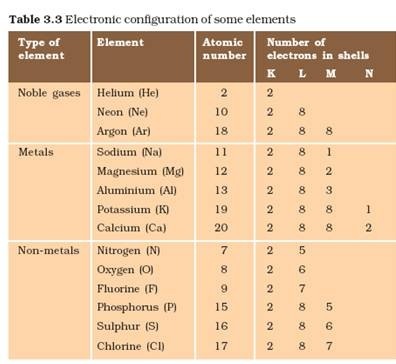 Let us have a look at the electronic configuration of noble gases and some metals and non-metals. We can see from Table 3.3 that a sodium atom has one electron in its outermost shell. If it loses the electron from its M shell then its L shell now becomes the outermost shell and that has a stable octet. The nucleus of this atom still has 11 protons but the number of electrons has become 10, so there is a net positive charge giving us a sodium cation Na+. On the other hand chlorine has seven electrons in its outermost shell and it requires one more electron to complete its octet. If sodium and chlorine were to react, the electron lost by sodium could be taken up by chlorine. After gaining an electron, the chlorine atom gets a unit negative charge, because its nucleus has 17 protons and there are 18 electrons in its K, L and M shells. This gives us a chloride anion C1–. So both these elements can have a give-and-take relation between them as follows (Fig. 3.5). Sodium and chloride ions, being oppositely charged, attract each other and are held by strong electrostatic forces of attraction to exist as sodium chloride (NaCl). 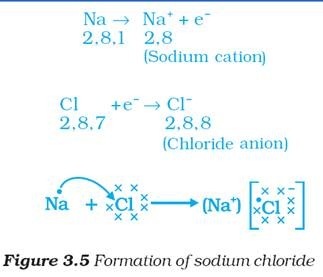 It should be noted that sodium chloride does not exist as molecules but aggregates of oppositely charged ions. 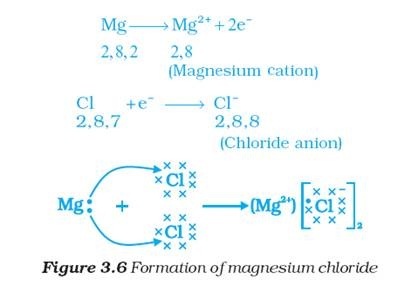 Let us see the formation of one more ionic compound, magnesium chloride (Fig. 3.6). The compounds formed in this manner by the transfer of electrons from a metal to a non-metal are known as ionic compounds or electrovalent compounds. Can you name the cation and anion present in MgCl2?